Proudly Queensland's Leading provider of Mobile Pamper Parties since 2008. Our Accredited Therapists come to your Home or Venue in the Gold Coast, Brisbane and Ipswich regions. Call us today to book a party for your Teen Queen on 1300 700 627. Our Teen Birthday Pamper Parties are suitable for girls aged 13 - 17. A Teen Queen Pamper Party is based on a mini day spa theme. You can also create your own Pamper Party Packages and treatments from our adult Pamper Party Menu. We aim to please and to give you the options to create the perfect party for your needs! File, trim and buff of nails, choice of professional polish from our range of pastels, funky brights & glitters. - Includes a special gift for the Birthday girl. - All party girls receive a nail polish & nail file to keep. These come in an organza gift bag. Chocolate Facial - cleanse, organic chocolate face mask, hot steamed towel removal, organic moisture dew moisturiser. While mask is on, enjoy a relaxing hand massage. Total package for 8 $280 (2 hours). - All party girls receive a beautifully presented nail polish and nail file to keep. Glamour Hair Curls - $20 per party guest. Hands - File, trim and buff of nails, large range of polish with pastels, funky brights & glitters. Feet - Foot spa, file, trim and buff nails, professional nail polish with pastels, funky brights and glitters. - All party girls receive a beautifully presented nail polish and nail file to keep in an organza bag. File, trim and buff nails, professional nail polish with pastels, funky brights and glitters. Organic Chocolate Facial - cleanse, organic chocolate face mask,hot steamed towel removal, organic moisture dew moisturiser, relaxing hand massage. Professional Manicure or Pedicure. Includes trim, file & shape of nails, base coat & choice of professional polish from our range of colours and glitters. Complimentary nail art on 2 nails. Shiny quick dry top coat. - Includes a special beauty gift for the Birthday girl. 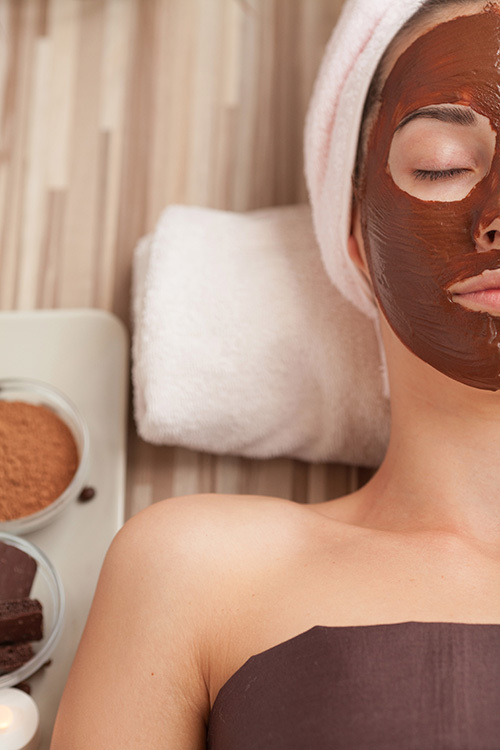 15min Facial - Lay back and enjoy a cleanse, delicious chocolate face mask, hot steamed towel and finished off with a nourishing moisturiser. While your mask is on, you will enjoy a relaxing head & scalp or hand & arm massage. Gift bags for party girls to take home. - Includes a birthday gift for the Birthday Girl. Professional Manicure - File, trim and buff of nails, large range of polish with pastels, funky brights & glitters. Professional Pedicure - Foot spa, file, trim and buff nails, professional nail polish with pastels, funky brights and glitters. Complimentary nail art on 2 finger nails and 2 toe nails. Pink & black work station setup. Professional Manicure or Pedicure - File, trim and buff nails, professional nail polish with pastels, funky brights and glitters. Edible Chocolate Facial - cleanse, chocolate face mask,hot steamed towel removal and moisturiser. While your mask is on, enjoy a heavenly head & scalp massage or hand & arm massage. Just wanted to let you know that Cassandra's party was "the best ever". All the girls had a wonderful morning being "Teen Queens" with a luscious pampering by you. They sang their hearts out, chattered and giggled and came away so happy with gorgeous nails and bright, glowing faces. Cassandra especially loved your hand massage. You are delightful and we will definitely be seeing you again. Thanks, Beulah and Cassandra, Brisbane. The teen pamper $250 packages above are Inertia's minimum party requirements. We come to you at your home, or in a venue of your choosing, in the Brisbane, Ipswich and Gold Coast regions. We are a mobile service, that comes to you. We do not have our own venue or salon. Make sure to book, your teen queen pamper party in advance, to avoid disappointment. You must advise and pay in full, the Tuesday before the party, if there will be any extra party guests. Cancellation fees apply, for less than 2 weeks notice. We accept mastercard, visa, paypal & direct deposit. Please do not hesitate to call us on 1300 700 627 if you have any questions. Inertia's Therapists are fully accredited and insured professionals.